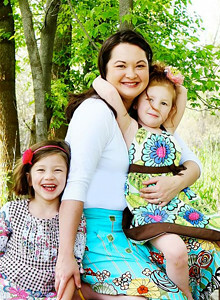 The Fat Quarter Shop is excited to welcome Carina Gardner to the Jolly Jabber. 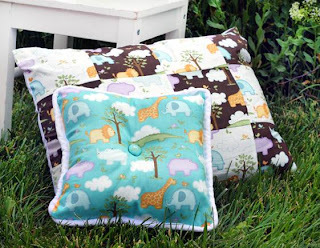 Carina’s latest fabric collection is Baby Safari from Northcott Fabrics. Q: What was the first seed that grew into the Baby Safari collection? A: My little sister was adopting her first baby. 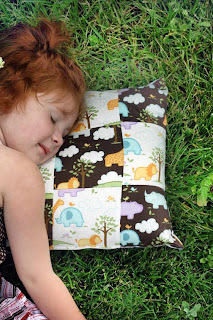 I made a digital scrapbooking kit with little elephants and giraffes and donated all the proceeds to her adoption. I fell in love with the little animals and started drawing more. I decided that it would make a sweet baby line and before I knew it I was designing Baby Safari! A: I like the 4527-36 (chocolate master fabric) the best. I love the contrast of colors. A: Making an entire bed set with baby quilt, bumper, and sheets! Oh and maybe some framed art. It screams "Put me in a baby's room!" My sister-in-law just had twins and the set is perfect for boy (blue set) and girl (purple set) baby/toddler rooms. I wish I was listening to something cool, but for the last few months I've been forced to listen to Harp CDs since my daughter Siri has taken up the harp. 3. Work and life essentials aside, what is the activity you spend the most time doing? Hanging outside. That generally means visiting with friends or neighbors & gardening. I live in this super-friendly neighborhood. We do popsicle nights in the summer, and I'm trying to get a night-time game of capture the flag going. We have a fireplace in our backyard, which means a lot of smores and sitting and shooting the breeze. 4. Where did you grow up and where do you call home? I grew up in Clarksville, Tennessee. I had a strong southern accent. My husband says it still comes out when I talk to one of my sisters or I get mad. I now call Salt Lake City home. We moved here three years ago from MInnesota. 5. Do you have any pets and what are their name(s)? We have one kitty named Rosy. She's a brown tabby. I spend a lot of time locking her out my studio since she likes to sit directly on the computer keyboard as I work. 6. What color are you thinking about today? Tiffany blue. No idea why. Dresses feature: Pinfeathers, Baby Safari, & Dress Up.